The third edition of Textrum, the biannual textile trade show showcased by the Vardhman Group, put forward the best in textile innovation for the S/S 2020 season. 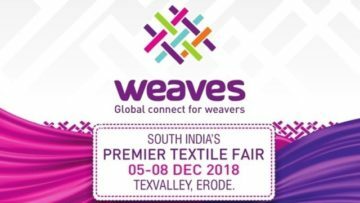 The largest textile conglomerate in India encapsulated twelve different collections that boasted of innovation in sustainability, blends, construction techniques, surface exploration, design sensibility and functional finishes. The first day of the fair was a hit as visitors from ITC, ABFRL’s Madura, Arvind, Myntra, Raymond and K. Mohan discerned several favourites out of the exhibits. This year, the textile pioneers collaborated with Tencel and R|Elan, the innovative fabrics division of Reliance. For this category, Vardhman exhibited several new fibres, fabrics and product categories, especially under its partnership with R|Elan and Tencel. The Green Gold fabric released with R|Elan is made out of fibres that boast of lowest carbon footprints constructed from 100 per cent used pet bottles with a transparent supply chain. Another addition was the new TENCEL® generation Refibra™, that stands for ‘Reduce, Reuse and Recycle’ with its constituent fibres based on the lyocell production process, offering a deep sustainability profile that promotes circular economy. Vardhman also overcame the lack of denims in its offering by coming up with the denim look-alike fabric in a woven yet feel-like knit fabric form that promised better functionality being flexible through its construction. It also provided three colour stories namely Rust, Soft and Denim, opening the opportunity to create new products using non indigo processes all promising the denim look. As the consumer groups turn towards a more casual, health-oriented lifestyle, they now yearn for fabrics that are aesthetically formal yet provide ease in movement and durability. Vardhman uses innovation at the fibre as well as construction level to cater to this demand with introduction of fabrics such as Power Stretch and 360 degrees stretch. The power stretch fabric, with up to 35 per cent elongation and absolute recovery along with the four-way stretch fabric, are the biggest instances of this segment. The fabrics do not compromise on the hand feel as well, as they have incorporated the use of blends such as modal, tencel and viscose. On the finishes front, the HealthGuard Premium Protect inclusive of anti-mosquito, anti-bacterial and anti-fungal treatment, the Silvadur anti-microbial and odour-control technology, the miDori Biodry technology with high wicking and drying properties along with the zero formaldehyde resin finish for crease recovery were a hit at the event as well. With temperature controlled fibres , they introduced 37.5® Technology that keeps the wearer’s body at the ideal core temperature of 37.5° Celsius and regulates the micro-climate next to their skin at the ideal relative humidity of 37.5 per cent. Other additions included fast moisture absorbing fibre KoolTex and anti-microbial and anti-odour fibre Feel Fresh that had embedded silver nano particles to inhibit bacterial growth. Textrum S/S 2020 presented Vardhman’s foray into the womenswear segment, especially for topwear. One of the biggest hits out of the twelve collections showcased was the Monal range that endorsed an assortment of cotton blends with viscose, sustainable viscose, tencel, modal fabrics with high drapeability and softer tactile feel. After a successful Textrum S/S ’20, Vardhman is keen on hosting the event every season in Gurgaon itself, keeping a focus on its customers’ convenience with the aim to highlight textiles and fibre technologies that intersect all prerequisites of the industry – innovation, sustainability and design excellence.